We are a leading Manufacturer of cellular rubber gasket and cellular rubber seal from Mumbai, India. 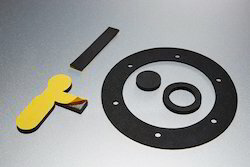 Cellular Rubber Gasket are made out of high-quality cellular rubber with excellent compression and weather ability to achieve the optimum level of IP protection NEMA compliance. Long lasting and excellent aging properties. Owing to our expertise in this domain, we are engaged in offering a supreme quality Cellular Rubber Seal. The offered rubber seal is checked in terms of quality before supplying to customers. 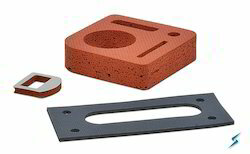 This rubber seal is made by a supreme class material with the help of latest techniques in compliance with set standards. Provided rubber seal is come up with permanent pressure sensitive adhesive solutions. MNM can manufacture tailor made Profile Seals in all different types of Cellular Rubber Products like Nitrile, EPDM, Neoprene, Silicone As per customers requirements. MNM can also match international specifications if needed. These seals are provided with permanent pressure sensitive adhesive solutions. Applications in extremes conditions require primer. Our special purpose primer Acts as a cleaner and also improves the adhesion. Looking for Gasket Seals ?